This is a dealer only auction. Buyers must be approved and registered by Auction before buying vehicles. Buyers are considered professionals, and are responsible for knowing the auction rules & policies. Auction reserves the right to refuse service to anyone. 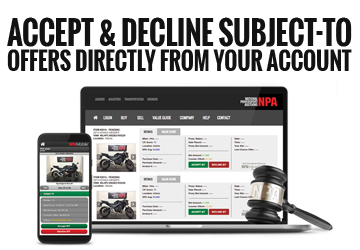 NPA's website is only for internal use by dealers and their employees. NPA's information & pictures are not to be shared with anyone outside the dealership. No portion of NPA's information & pictures can be displayed on other websites in any form. Dealers cannot use software packages or other means to "scrape" information from NPA's website. Dealers' customers must believe they are buying vehicles from the dealer, not NPA. Dealers accept full responsibility for vehicles they purchase from NPA, their condition, and any issues reported by dealers' customers. Misusing NPA's information, pictures, brand, logo or other abuses will result in termination of Dealer's account. Buyer represents that it is a licensed vehicle dealer engaged in the business of buying and selling vehicles. Buyer has provided to Auction a complete dealer information sheet required by Auction, and Buyer represents that all of the information provided to them is true and correct. Buyer recognizes and acknowledges that Auction is not to be deemed seller of any vehicle. The transferor is required to give the Federal Odometer Mileage Statement in connection with any sale from this auction within the contemplation of the Motor Vehicle Information and Cost Saving Act of 1972 (pub.192-513) as amended or similar laws. The seller named on the Bill of Sale is the transferor within the contemplation of such laws. All sales at the auction are conducted under Auction Rules/Policies. Buyer acknowledges receipt of a copy of the Auction Rules/Policies and Buyer agrees to be bound by such Rules/Policies as amended from time to time. Inspect vehicles closely for year, make, and condition before bidding. The Auction does not guarantee vehicles delivered to it for sale; rather Buyer is responsible to verify condition & mileage. Years posted are not guaranteed. Auction considers a vehicle sold when auctioneer says sold and recognizes bidder number on the auction floor. At this time, winning bidder is responsible to complete purchase transaction with Auction on auction day, including payment of vehicle. Announcements made on sale day will take precedence over any items listed in the auction catalog. Condition information and NADA Book values are not guaranteed by Auction for accuracy. Auction has not verified, and makes no representation or warranties as to the description, equipment, and odometer readings on any vehicle. Auction does not guarantee that the vehicles are in safe condition, or suitable for use on public roads or waterways. Buyer assumes the responsibility to verify all such representations and descriptions of catalog in relation to each lot number up for bid. Buyer will examine and accept the vehicle in its present condition. All sales are final on an "AS-IS, WHERE-IS" basis, without warrantee or guarantee of any kind. All checks may be made payable to National Powersport Auctions. No bank drafts will be accepted. Buyer will pay Auction the purchase price of the vehicle(s) plus applicable fees, by cash or check (AS APPROVED) immediately upon checkout on auction day. Upon failure to pay, Auction may, without notice to Buyer, dispose of purchased vehicle(s) through a subsequent auction sale, and Buyer will be liable to Auction for all costs of collection, loss of the resale of the vehicle, and any other damages Auction may sustain, including reasonable attorney's fees incurred in collecting payments due and interest. Buyers are required to pay for purchased auction vehicles on auction day. A late payment of $25.00 per day may be applied to each vehicle not paid in full on auction day. Buyer's method of payment must be approved by Auction before auction bidding. All company checks must be pre-approved. All accounts must be current before vehicles or titles will be released. Usernames are visible to others. Usernames may not contain profanity or spellings that can be interpreted as obscene or defamatory. If such names are discovered to be in use, NPA will ask you to change it and may temporarily block your account access until the change is complete. Buyer represents that they will pay Auction full bid price, together with posted fees, upon the day of the sale by cash, company check, or cashier's check. In some pre-approved cases, wire transfers will be accepted as payment. Buyer also represents that upon delivery to the auction of a check, that sufficient funds are available and will remain on deposit at Buyer's bank to fund the check. Until full payment has been made to auction for vehicles purchased, title to all vehicles, and all rights to enter said vehicle(s) into the stream of commerce will remain in Auctions control. Dirt bike stands and watercraft carts are not a part of the sale and will remain the property of Auction. Vehicles may be started before the auction begins. Do not rev or gun engines while examining vehicles. AT NO TIME MAY VEHICLES BE DRIVEN! During the auction no vehicle may be started or removed from the premises without consent of Auction. Removal or switching of any parts or items from one auction vehicle to another is strictly prohibited. No mechanical work, unless performed by NPA with a work order, is allowed on Auction property. Buyers are responsible for understanding the price and conditions the auctioneer is saying. Auction reserves the right to interpret its policies at its discretion. Auction's decision is final. California Law requires 7500 miles on any vehicle from out of state without California emissions to be registered in California. Please be aware of these vehicles. It is the responsibility of Buyer to arrange transportation of their purchased vehicles and to remove them from our facilities within 5 business days. National Powersport Auctions will assist buyer with transportation contacts and loading, if requested. After 5 business days a storage fee of $5.00 per unit per day will be assessed to Buyers' account. Auction assumes no responsibility for collision, fire, theft, or any other damage to any vehicle, before, during, or after the sale. Vehicles and property left on the premises are left at the dealer's own risk. Vehicles pulled on "No Sales" and not removed or vehicles left over 5 days will be charged a storage fee at the rate of $5.00 per day. Buyer agrees to hold Auction harmless for any damages from result of loading vehicles for shipping. Shipping is the Buyer's responsibility; any trucking firm suggested by Auction is only a recommendation. Buyer agrees to honor payment of check immediately when presented to Buyer's bank for payment. Buyer will not, under any circumstances, stop payment on a check. All returned checks will be subject to a minimum $100.00 return fee and must be paid immediately by cash or cashier's check in order to avoid any further collection expenses. -In order for vehicles to be numbered in the live auction, vehicles must be dropped off at least two days prior to the auction. -All vehicles dropped off as a Cross Dock are subject to a $20 per unit Cross Dock fee. All Cross Dock fees are required to be paid in full prior to release. -All sold vehicles are subject to a 7% sale fee (minimum $50.00 per unit) and any fees incurred above, or $80.00 no sale fee. -All sold units will incur a $35.00 Processing Fee. -Any Title that is not received by auction will receive a $10 Title Coming Fee(per title). This includes floored titles, with the exception of NPA Dealer Flooring Titles. -I/we appoint National Powersport Auctions as my attorney in fact to complete all necessary documents, as needed, to transfer ownership as required by law. -NPA does not provide title insurance and does not warrant or guarantee that a title provided by any party is valid, assignable, unattached or is not forgery. -If unit is received with a dead battery or missing key, a replacement will be installed and you will be billed accordingly, unless otherwise specified. -Dealer is responsible for the accuracy of the consignment form and odometer statement. -Dealer agrees to indemnify and hold harmless NPA for any damage, claim, or cost incurred by NPA as a result of any misrepresentation for whatever reason, even if previously unknown. -NPA reserves the right to list and announce all known defects or damage on the auction list. - I consign this vehicle subject to the terms and conditions of dealer registration, auction invoice, bill of sale, current NPA rules and policies and the condition of the consignment vehicle stated hereof. Dealer is responsible for any non-disclosed damages to or on any vehicle that is not announced at the signing of this agreement. -Conditional sales may not be removed from auction facility until buyer has opportunity to purchase unit at sellers agreed price.